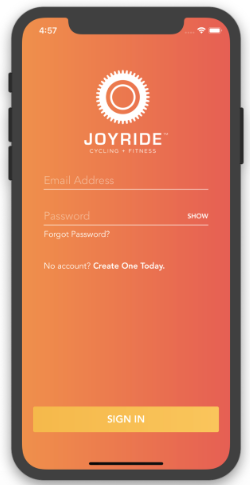 JoyRide Cycling + Fitness customers now can have a new iOS application (app) that enables JoyRiders to manage their accounts and book classes more easily from an iPhone mobile device or iPad. The JoyApp is available on the App Store as of Wednesday, Dec. 5 and is timed in conjunction with the relaunch and redesign of the company’s website, also occurring this week. The app creation and rebranded website were also intended to occur well in advance of January, typically a peak fitness month, post holidays. While many fitness studios have long offered apps, JoyRide elected to wait for the right moment to do so. JoyRide Cycling + Fitness Studio is a premier fitness boutique dedicated to calorie-torching, interval-based, athletic indoor cycling and cross-training classes. Since 2011, JoyRide co-founders Amy Hochhauser and Rhodie Lorenz, two pioneers in the boutique fitness industry, have launched seven studios with an inclusive, positive vibe. Talented and enthusiastic instructors, including two Nike ambassadors/trainers and several Division 1 athletes, lead challenging workouts set to motivating music. In all four studios, JoyRide offers off-the-bike, cross-training classes to complement cycling, including mat Pilates, Barre, circuit and sculpt. JoyRide classes are geared toward all ages, genders and fitness levels. The culture of JoyRide is more than fitness: it’s a culture of good health, motivation, empowerment and spreading joy. Editor’s note: Darienite publishes announcements of major developments announced by Darien organizations, stores and other businesses. Send announcements to dave@darienite.com.